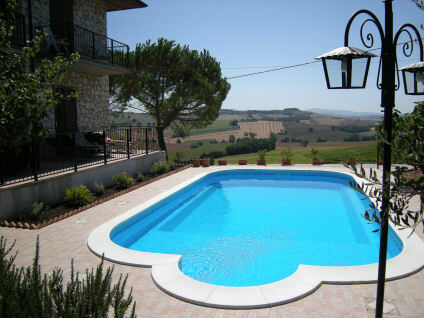 Set on a peaceful Umbrian hillside with panoramic views over countryside with olive groves, vineyards and sunflowers – to Lake Chiusi glistening in the distance, or towards Cortona and Montepulciano from the front. 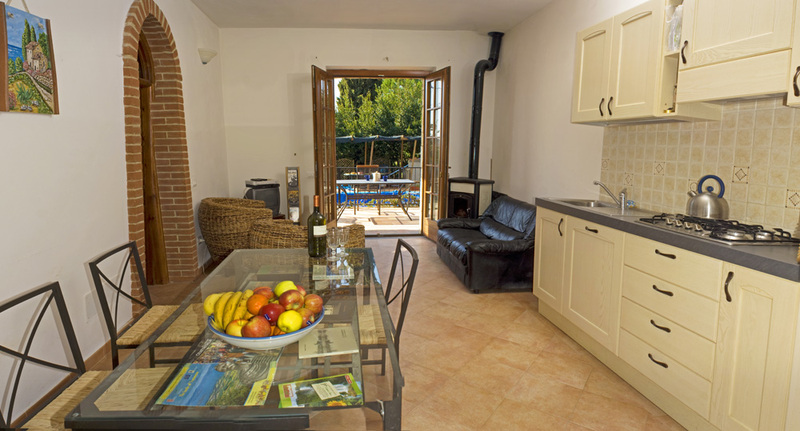 Our second ground floor 2 bedroom apartment(Limone) offers light airy country style accommodation with a wonderful sun filled terrace and good size rooms. There is a wood burning stove and central heating for out of season occupation. 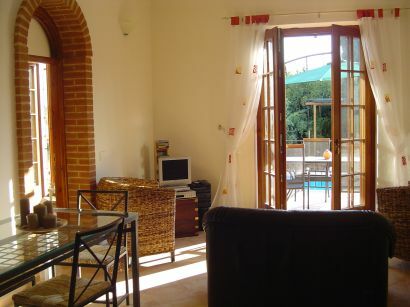 The rooms terracotta tiled throughout,are furnished country style with wrought iron and rattan. The cream wood kitchen area has a fitted fridge, electric fan oven, gas hob and dishwasher and is supplied with 6 piece cutlery & crockery, a selection of cookware & utensils, teapot and Moka espresso maker. 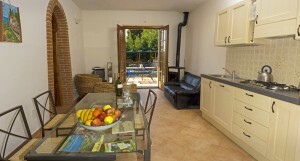 The living area comprises two rattan armchairs, leather sofa, wrought iron dining table with seating for 4. There is a combination tv & video player, dvd player and internet access in the apartment and a selection of books, dvd’s and games available in the foyer to the apartment. Welcome pack provided. Home produced extra-virgin olive oil, fresh eggs and wine available.